Although laparoscopic surgery is one of the treatment options for colorectal cancer, certain technical problems remain unresolved for the radical dissection of regional lymph nodes (LNs), which is essential to improve treatment outcome. 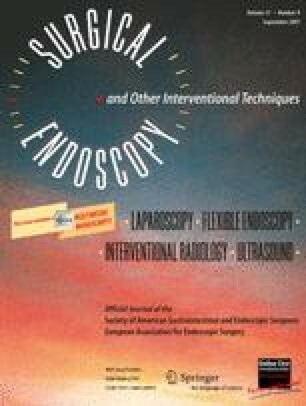 We present a safe procedure for laparoscopic right hemicolectomy to dissect the regional LNs along the superior mesenteric vein (SMV). The key characteristic of our procedure is that all right and middle colic vessels are cut along the surgical trunk using only a medial approach. First, the pedicle of ileocolic vessels is identified and the mesocolon is dissected between the pedicle and the periphery of the SMV to expose the second portion of the duodenum. The ileocolic vessels are then cut at their roots. The ascending mesocolon is separated from the retroperitoneal tissues, duodenum, and pancreatic head up to the hepatocolic ligament cranially. The important detail in this procedure is the wide separation between the pancreatic head and the transverse mesocolon. This procedure uncovers the course of the right colic artery, veins, and the gastrocolic trunk . The right colic artery and veins can then be safely cut at their roots. For an extended right hemicolectomy, the middle colic vessels can easily be identified below the lower edge of the pancreas and cut at their roots . We performed curative resections in this manner for 16 consecutive patients with advanced right-sided colon cancer without any serious intraoperative complications. The median number of retrieved lymph nodes was 31 (range = 9–57). The median operative time and intraoperative blood loss were 274 min (range = 147–431 min) and 45 g (range = 0–120 g), respectively. The postoperative course of all patients was uneventful. Four of 16 patients had node-positive disease. With a median follow-up period of 272 days, all patients are alive without recurrence. We consider this a safe method for radical LN dissection during laparoscopic right hemicolectomy. The online version of this article (doi: 10.1007/s00464-007-9305-x) contains supplementary material, which is available to authorized users.